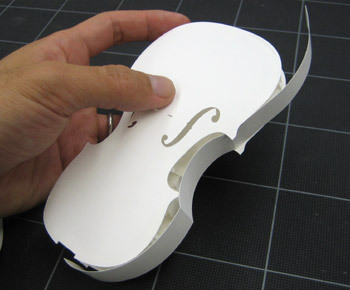 HANDSON Paper Craft Violin "How To"
By popular request, we've created an online instruction page for the HANDSON paper craft violin. Those of you who have purchased other instruments should also find this helpful. 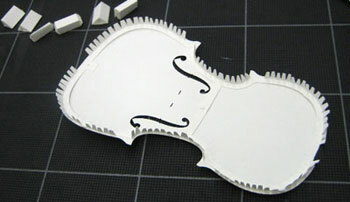 Carefully separate the soundboard and the glue-tab frame (the piece with all the glue tabs). 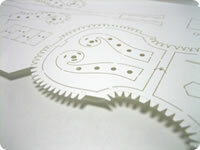 The parts are pre-cut by laser so you'll only need to make several snips in order to seperate them from the sheet. Bend each glue-tab once seperated. 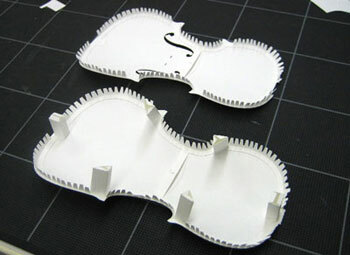 You can precisly position the glue tab agains the soundboard by aligning the holes in each. 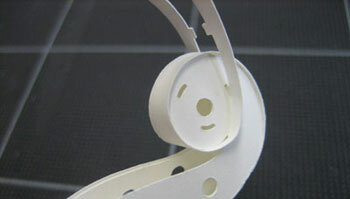 On the neck-side align the glue tab frame with the center of the indentation where the neck will be positioned. 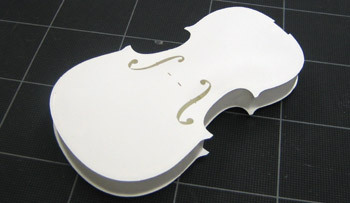 Fix the frame against the soundboard using glue. But be careful not to glue the strip below the f-holes. See next step before proceeding. 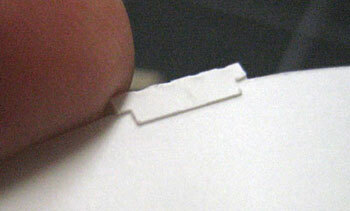 Pull on the strips below the f-hole until they overlap a bit, then glue them together. This is to maintain the curvature of the soundboard. 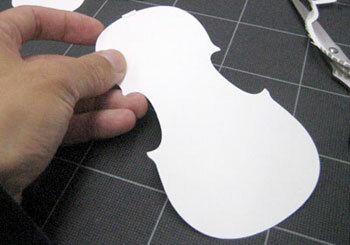 Be careful not to make them overlap too much or the curvature will be too strong and will distort the final result. Likewise don't make it too flat either. 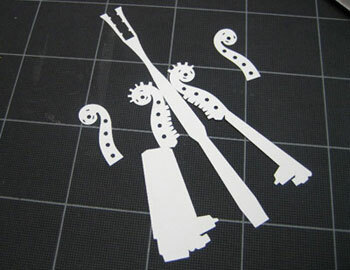 Also make sure not to apply too much glue or the pieces will slide apart before they dry. Everything in moderation is the key to success. 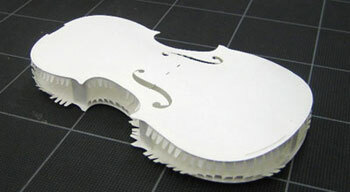 As with the soundboard, apply a little curvature on the back board and side boards before proceeding. 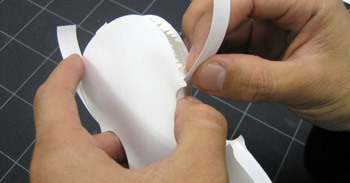 Fold back the tab on the neck-side. Align the neck side as shown in the photo. Glue the glue-tab frame against the back board. 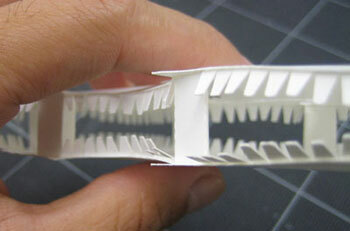 Again, apply curvature by gluing together the two strips in the middle. 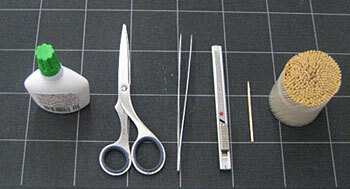 The photo shows the two strips being held together with a pair of tweezers until they dry. 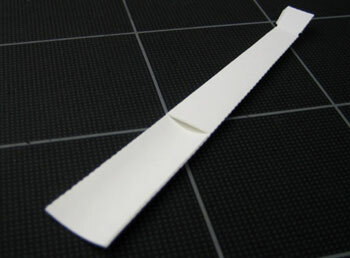 These strips will have to bear a lot of pressure during assembly, so please make sure the glue is completely dry and the two strips secure before proceeding. Assemble all the columns. These will be used as structural support for the body. Glue one end of each column on to one of the boards (either soundboard or back board is fine). Shows six of the columns glued onto the back board. Glue on the soundboard (or the back board if you started by attaching the columns to the soundboard). Because of the curvature on the boards the columns will tend to slide inwards. 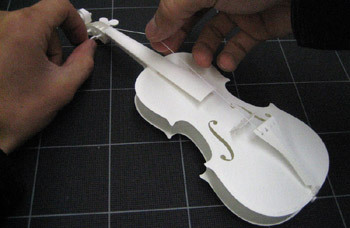 Carefully adjust the position of each one as you glue so this doesn't happen. Be careful that the columns are applied in the same positions on both boards. Here's what it typically looks like from the side. Glue on the side boards (or bouts). 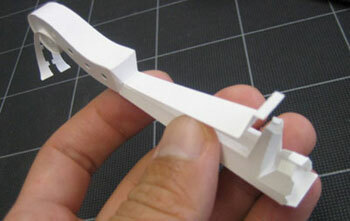 Make sure the to apply natural curves on the parts before proceeding with this step. Attach to column next to the f-holes first. 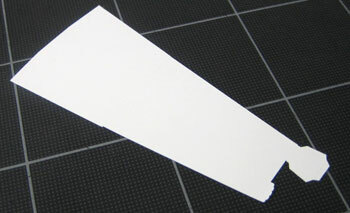 Make sure the fold on the side is aligned agains the edge of the column. Here's a close-up. 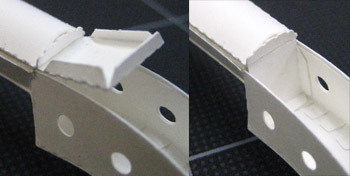 Be carful not to twist the body when attaching the side boards. Do the same for the other side. 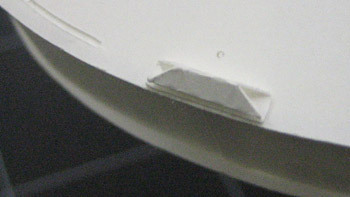 Attach the lower bouts (or the side on the lower half). 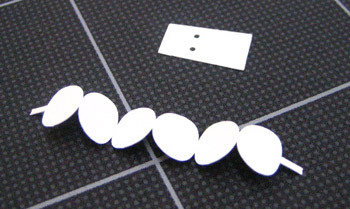 Apply glue to all tabs on the lower half and attach in a single motion. Don't push too hard on the side or the board will cave in. The trick is to apply slight pressure on both the back board and soundboard while doing this so the boards don't fly apart. 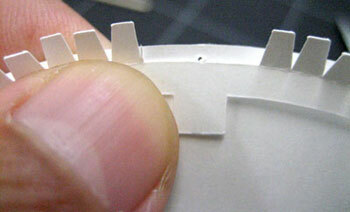 The photo shows the middle finger and thumb applying pressure while the index finger attaches the side board. Make sure the end edge of the side board is parallel to the edge of the column. If not, it's likely that the side board is distorted somewhere and you should fix it before the glue dries. The side board on the "waist" is a little hard to glue on, but shouldn't be too difficult if done carefully. Again, be careful not to apply too much pressure. If done right the fold should match with the other column on the upper side of the waist. 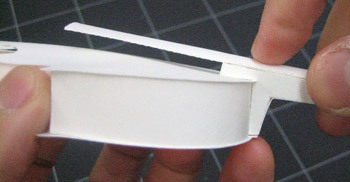 In the same way, attach the upper bouts (side board on the top half near the neck). Here the edge of the side board will NOT align with edge of the column. Here's the completed body. Take a deep breath. Behold the beauty of what you've created so far before contemplating the trials ahead. Satisfying, is it not? Also would be a good time for a coffee break. 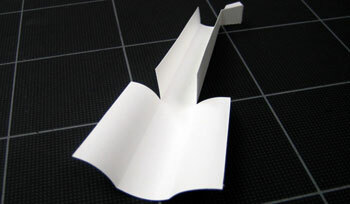 The scroll will consist of two layers of paper on each side for structural strength. 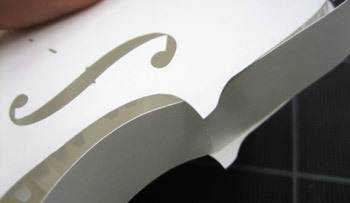 Attach the supporting pieces on the insides of the scroll. Glue the pieces together. 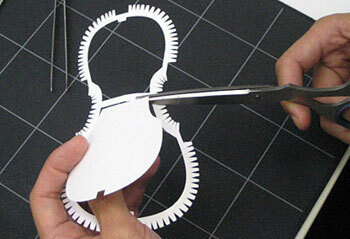 The neck twists easily so check for any distortion as you apply each piece. The scroll is the most important and most difficult part of the whole process. Attach the outer surface first, hook the tab into the first hole and wait for the glue to dry Don't apply glue to the hole at this stage. Just hook it to keep the piece in place. 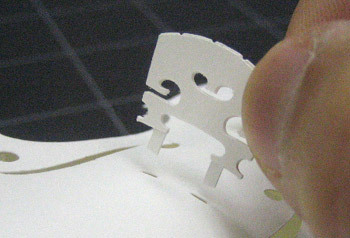 Apply a small amount of glue to the three holes and attach the remaining part. 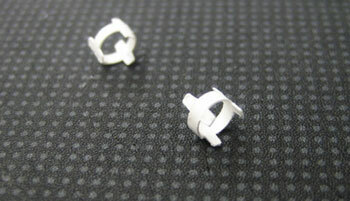 Attaching to each hole in sequence (one after the other) will almost certainly NOT work. The trick is to curl it and attach in one go. If the curvature isn't smooth you can use a pair of tweezers to adjust. Insert the center rod and fix. Attach the round pieces to close the ends of the rod and you're done here. The finger board is made of a single part. Fold as in the photo to add a little curvature. Do the narrow end first. 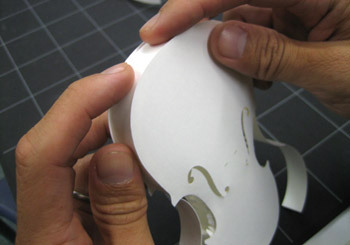 Glue the flat pieces together to create a curved, semi-circular cross section. Be careful of distorting or twisting. Do the rest of the board. Unlike the top part, here the cross section should look like a thin crescent moon. 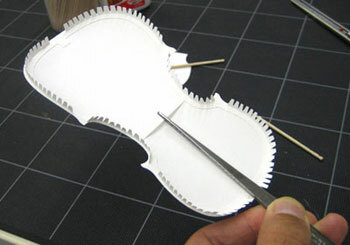 Correct any distortions before the glue dries out. You'll not be able to fix it once the glue dries. Attach the finger board to the neck. 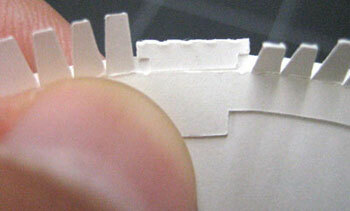 Glue the protruding piece on the end of the finger board to the insides of the peg box. Softly widen the peg box when you insert. 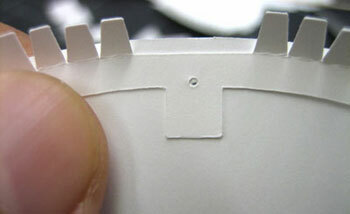 The tailpiece has some small parts so take extra care when detaching. 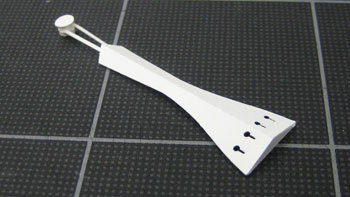 By the way, this tailpiece is a Hill Model. 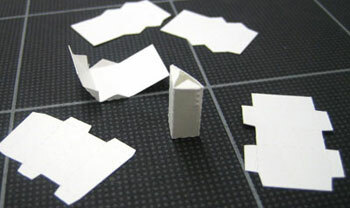 Warning: The newer paper models will have slight differences compared to the one shown in the photo. For new models please follow the instructions that come with the product. 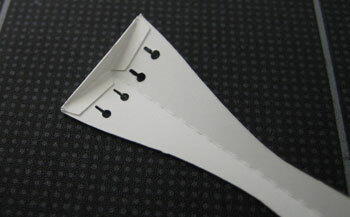 Fold the tailpiece and attach the triangular part. 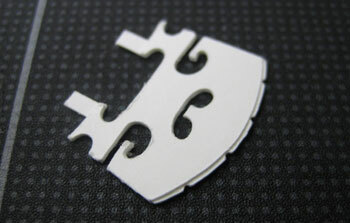 Assemble the endpin and attach to the tailpiece. The bridge comprises of three parts. They are very delicate so please detach them with care. Attach the three together with the one with the "legs" in the middle. 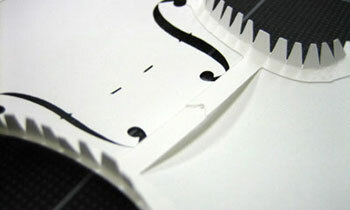 The center layer will have four indentations that will be the guide for the strings. 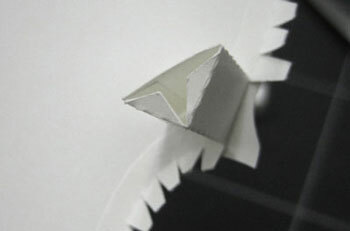 Glue to make a triangular cross-section. 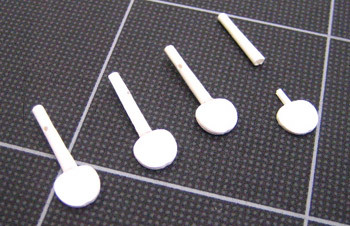 Pegs comprise of two parts each. Roll the axis. 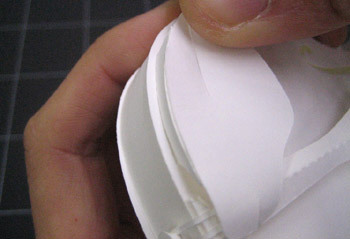 Glue all the layers that make up the pinch so it's nice and thick. 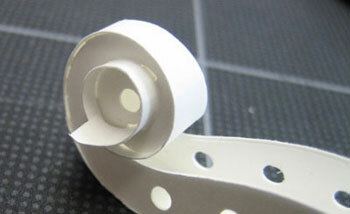 Add a generous amount of glue to the end of the pinch and insert into the axis. Make sure the pinch and the axis are aligned and straight. 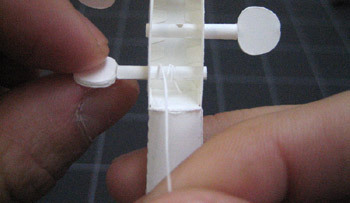 Wait for the glue on the pegs to dry out completely before proceeding. 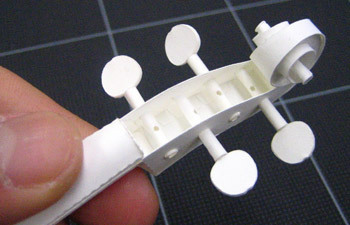 Insert the pegs into the peg-box once they're dry. The pegs should feel a little tight but this is as it should be. 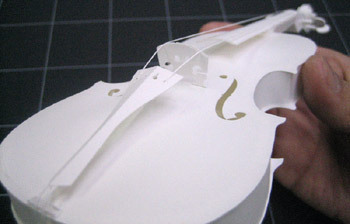 You'll notice that the mechanism is exactly the same as a real violin! Fix the neck onto the body. 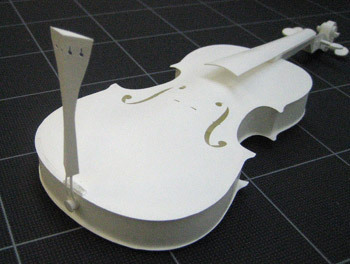 The angle of the neck should be such that the finger board is not too close or too far from the body. If you hold the bridge upright against the body you should be able to see where the strings will go. 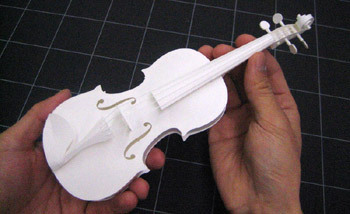 The fingerboard should be placed just below the strings. The photo shows the optimal position. Next, fix the mount onto the body. 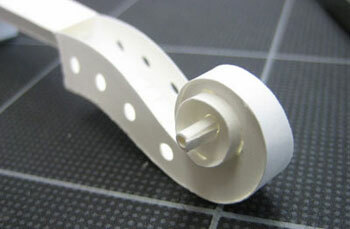 Attach so that the hole near the bottom of the body is aligned with the center of the mount. 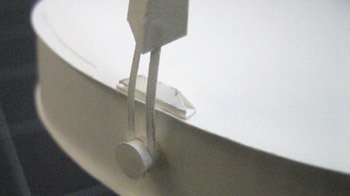 Glue the endpin on the center of the sideboard. It should be at dead center or equal distance from top, bottom, left and right. 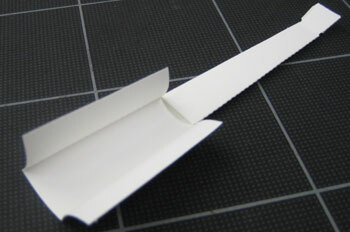 Warning: The newer paper models will have slight differences compared to the one shown in the photo. For new models please follow the instructions that come with the product. Glue only the endpin. The tailpiece should remain dangling at this stage. Insert the bridge but do not glue. The bridge is not symmetrical. You'll find that one side slopes downward more than the other. 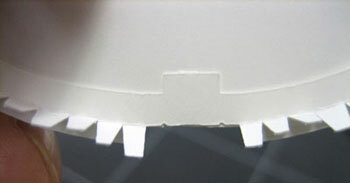 In the photo the side being pinched is the side that "slopes lower"
Thread string (the side with the knob) through the tailpiece. Insert the other end of the string through the hole in the peg. If the string is too long cut before threading. The string should be about 5cm or 2in longer than the length to the peg. Tighten the string by twisting the peg. 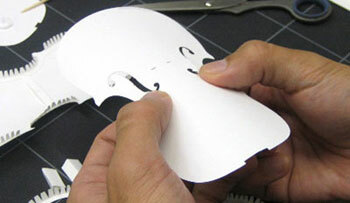 Keep the string lightly taut with your fingers while tightening - the rolled up string will look better that way. 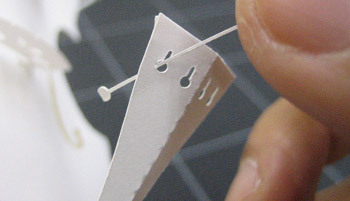 The photo shows a string being tightened. Be careful so the string doesn't detach from the tailpiece when you do this. The bridge is not glued so it may fall over while tightening. Make the bridge upright when the string is sufficently taut. 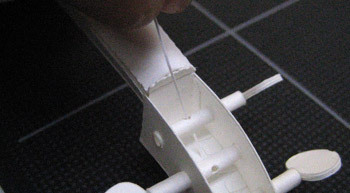 You won't be able to pull the bridge upright if the string is too taut so adjust accordingly. 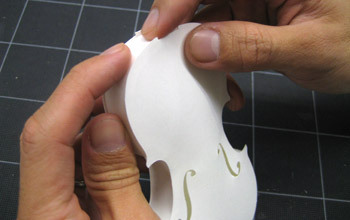 The photo shows the G string (the string producing lowest sound) and the E string (the string producing the highest pitch) strung. Now go ahead with the remaining two strings. The trick is to not tighten the strings too much until all four are in place. 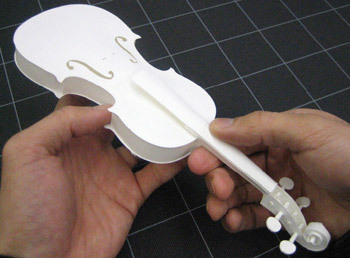 As with a real violin, the tightening of the strings will determin the final position of the tailpiece. Almost there. Lastly glue on the chinrest. Doesn't that look beautiful? Even if you made small mistakes along the way, it doesn't look so bad when the whole thing is completed, does it?. You can now hang it from the wall with the included attachment or put it in a glass case for all to marvel. We hope you enjoyed making your piece of art, and hope it keeps pleasing the eye for many years to come.